I already been in South Korea almost for 6 months, but then I have yet visiting Seoul Central Mosque, although I am a Moslem (blasphemy!) Anyway, after last week’s visit to COEX, I and my friend still have time to go to Itaewon because it is in the middle (not) of our way from COEX to go back to Incheon again. Anyway, we went there after all the hardships, because quite many line changes we experienced that day (3-5 lines). So, what is Seoul Central Mosque? 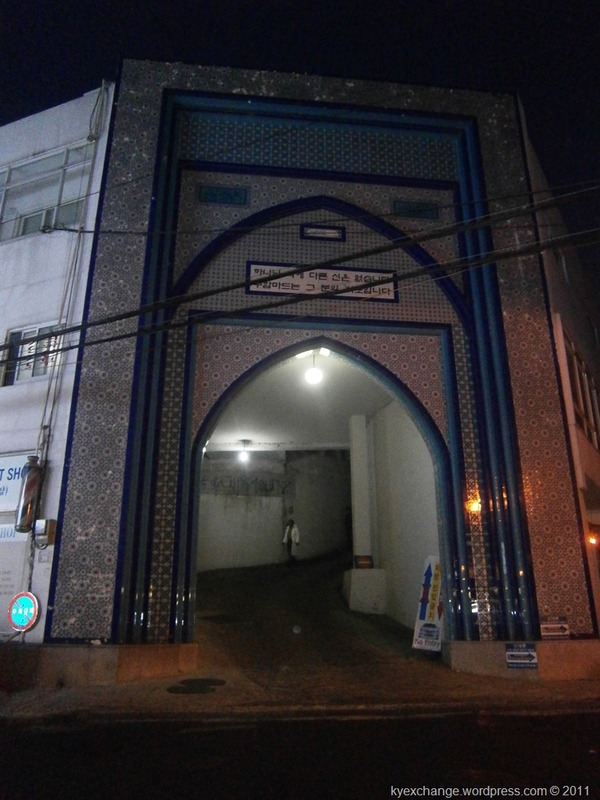 It is the first mosque in South Korea. Why it is phenomenal, because, as mostly Christian-Confucian and atheist country it is hard to be a moslem in South Korea (the food, the alcohol, and everything in between). Anyway, after all the hardship of the previous Korean moslems and donation from Moslem countries, the Seoul Central Mosque was built. 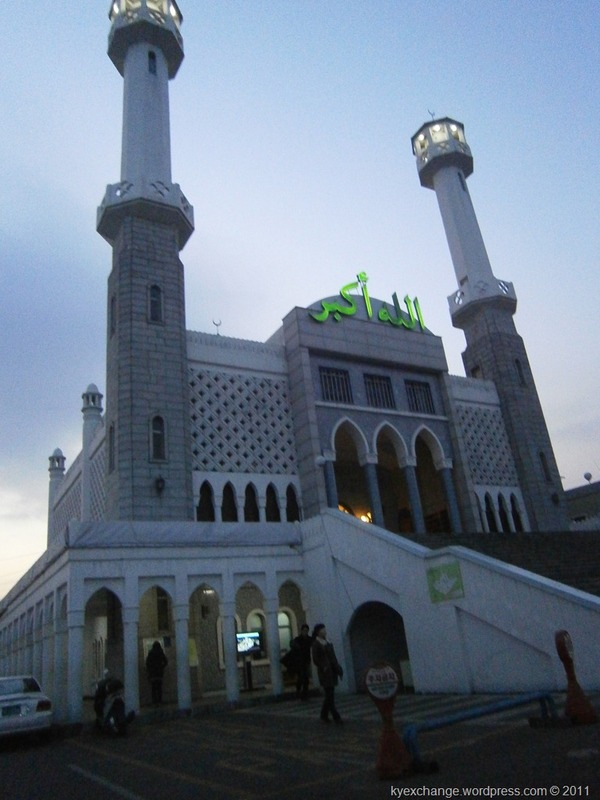 Today there are also mosques in Busan, Anyang, Gwangju, Jeonju and Daegu. According to Lee Hee-Soo (Yi Hui-su), president of the Korea Islam Institute, there are about 40,000 listed Muslims in South Korea, and about 10,000 are estimated to be highly active practitioners. So, how was it, visiting the central Mosque? When I was on my way from COEX to Itaewon, it was already around 5, and very we could join the Maghrib prayer , very fortunate. From Itaewon station, we just follow the way from exit three and go along the climbing the hill. 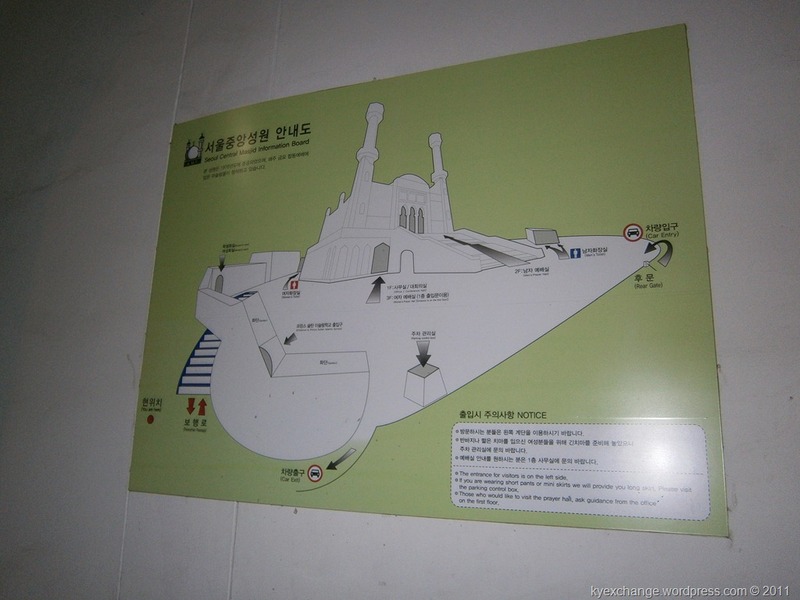 The Mosque itself is built on top of the hill, so you can se the Itaewon scenery from the mosque if you want to. After all the international restaurant (oh kebab, how I miss you so), we could see the Mosque‘s dome, and you could see also the gate to the mosque, a calligraphy-dome-ornamented gate. 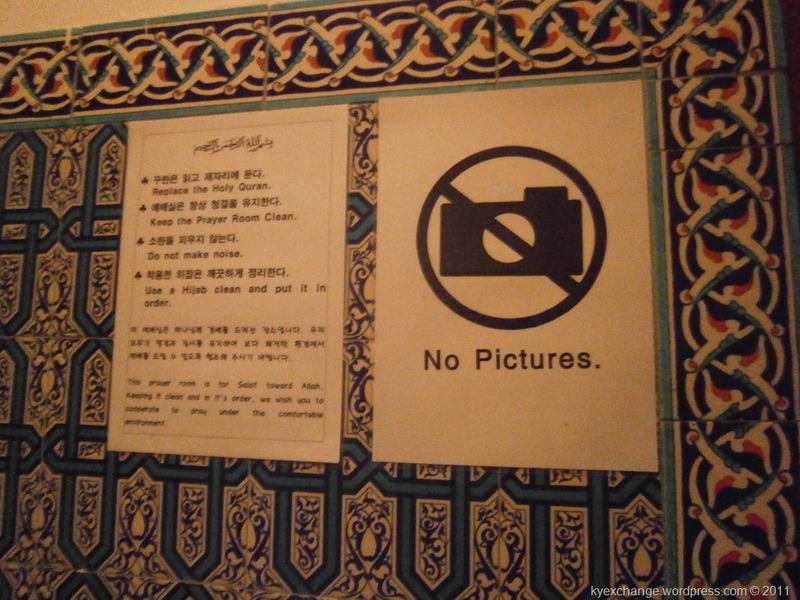 And I did think that there is no sign, except that you can see the Allahu akbar written in Arabic in the front. So, after entering the gate you must climb a little bit more, and voilà, you see the mosque. Anyway, because the prayer’s call already called, we just quickly separate, take wudhu, and then go the separate hall-one designated to men and the one designated to women. The one for women, how I say it, is on the 3rd floor, not in the first like I thought before, and it has a not quite round stairs that goes directly from the 1st floor with few confusing door along the way. Usually, when you have women’s hall in the 3rd Floor, it is good, better than the 1st floor one, because on this kind of arrangement, women can pray in congregate with men easier than when it’s separated without the view. I bring my own mukena (hijab, for praying) but you can borrow one there. And yes, no picture inside, so I cannot show you how it was inside. Anyway, I prayed Shalat Maghrib, there I saw around ten women that day, I think it is because that day was Saturday, and I speak with Malaysian students that also visited. After that, a little bit of exploring was done. It is a little bit weird to see in my way went there and in my way back, that many Koreans taking photos of the mosque, posing and such in front, like a tourism object, because, it is weird to see people thinks of your place of worship as a tourism material. At least I can relate, maybe that’s what people feel when we use temple as our background photo. Hmm. . Anyway, for you people who either non-Moslem, or Korean, or haven’t yet visited any mosque, or all of them, you can try to visit this mosque. I think it is quite a different scenery, especially for Korean, with all the domes. If you want to visit, it is better to visit in the Jumah/ Friday prayer time, Friday (that’s Jumah) around noon (1 pm), because there will be the most people there. Other than that, you can also see how Moslem prays 5 times a day (I wonder is there any of them that visit in Shubuh time, other than to pray). They offer a few information about Moslem and Islam in general, and if you contact the KMF before hand, they will give you more about it. The same with other religious place, you need more preparation to visit. Because this is an Islamic place of worship, it is very advisable to use anything polite, at least something that reached to the ankle and at least short-sleeved shirt. I saw it in some article, they provide long skirt (I do think that it is mostly for Korean high school and university girls ) to cover the leg. Only for praying? Not really. Because of the mosque, there are many business minds that have this occasion as an opportunity. So, there are many Islamic stores around. You can buy not in direct order hijab, veil, Islamic book, Al-Qur’an, and mostly I think Moslems come for the halal meat. 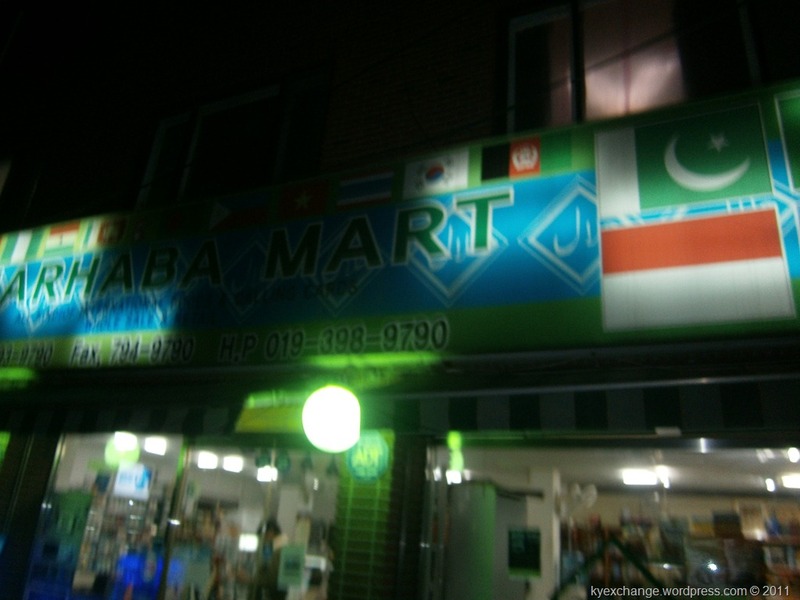 Most restaurants along the way from Itaewon station to the mosque are selling halal food. There is one that write (Selamat Datang (Indonesian/Malay: Welcome)) in the window also (Hmm, I am curious). Other than eating, you can also buy halal meat (that of course more expensive, I still can stand my fishes, actually). 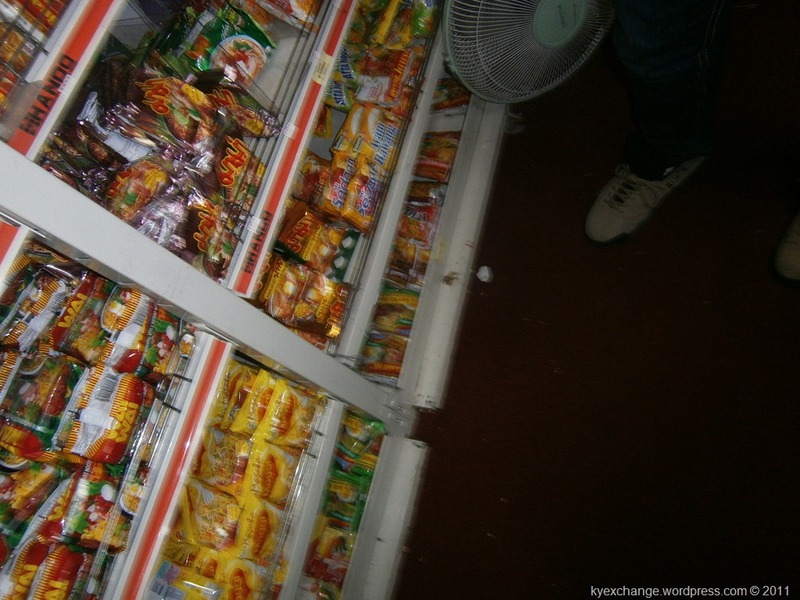 Other than that, there are also International Food mart, and quite complete as well, and also cheaper than the one in Daejeon, Indomie for only 500 (compared to 700 in Daejeon). Oh yeah, if you are a vegetarian, you can see many vegetarian signs that means vegetarian food is available. 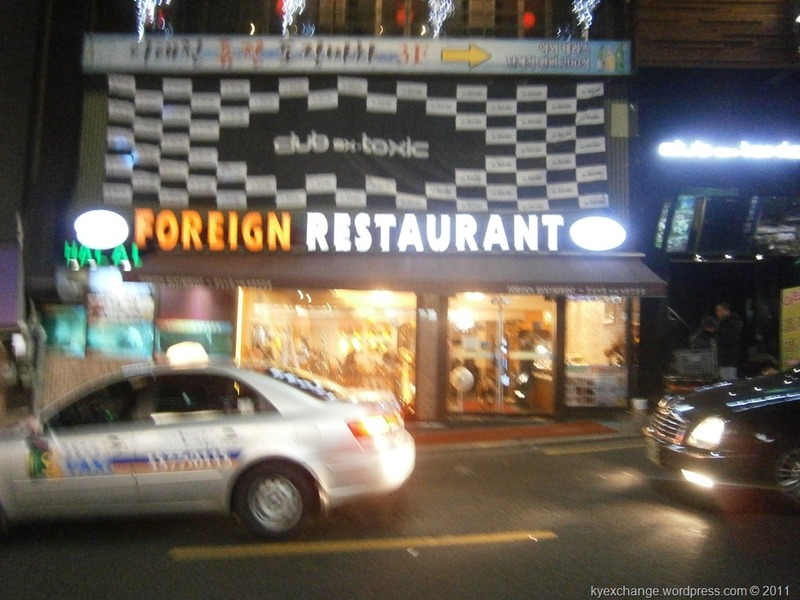 I do think there is no Indonesian restaurant around (Only saw one in Daegu) there, mostly Indian and Pakistani restaurant and of course kebab (have I said that I miss it. The Indonesian-cheap-one, I mean). If you want to taste kebab, visit the mosque, or experiencing a little bit of Islam in Korea, I do suggest you to visit. By subway: Use Line 6 of Seoul Subway, go to Itaewon Station, exit 3, go straight, turn right and goes along the hill (turn left to the Islamic Street ((Usadan-ro 10gil) . Or just ask, mostly the people will know English.